Learn tricks and earn titles from the comfort of your own home in one of our great Spark Teams! Is your dog reactive/fearful and unable to be in a class with other dogs? Is your schedule crazy and you are unable to attend a group class? 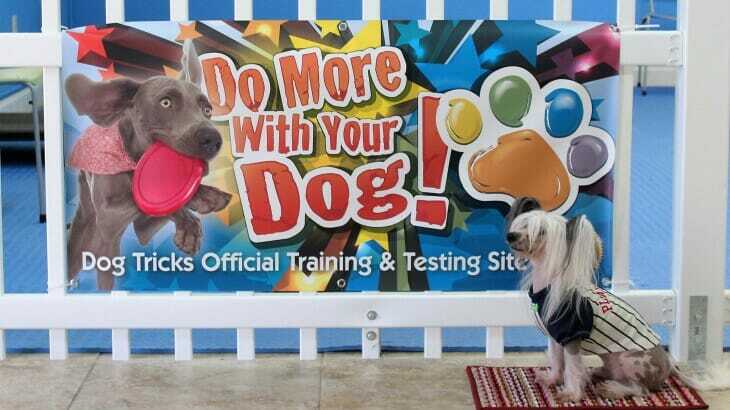 Or, are you just looking to teach your dog some new skills at your own pace at home? Then you might want to join one of our super fun and engaging online Trick Spark Teams. Our online Spark Teams give you the opportunity to learn a wide variety of different types of tricks, at home, through our Facebook groups and even earn titles for your dog. The best part…it’s FREE! Each month on the 1st, we start a new session and your goal is to teach your dog a certain number of tricks by the end of the month (of course, you can join up at any time). We offer all levels of titles from Novice to Champion and you are provided with step-by-step videos to help you learn all the different tricks to help you on your way. We call these Facebook groups Spark Teams, in the hopes that learning how to do these fun games and tricks might help you spark or ignite a passion for training your dog. The teams are part of the Do More With Your Dog program founded by world-renowned stunt dog trainer, performer and best-selling author Kyra Sundance. Your leader in these Spark Teams is owner of our Rockin’ Dawgs facility, Kim Mayes. Kim is a 3-time Trick Dog Champion, one of the founding trainers in the Certified Trick Dog Instructor program and on the CTDI Advisory Board. Each week Kim and Kyra team up to give you all the trick dog instruction you might need to achieve your goals. And on top of everything, it is an absolute blast! Everyone starts at the Novice level and as you achieve each title, you can move on to the higher levels. We really hope we will see you and your dog soon, so join us in the fun today!! News & Events brevard, dog training, dog tricks, domorewithyourdog, facebook, positive reinforcement, spark, team, trick training, tricks. permalink. New Book for Fearful Dogs!